Lotte Lehmann was a talented singer, teacher, poet, painter, and writer, so it should come as no shock that she would be good at reading poetry. On this page I’ll endeavor to supply samples of Lehmann reading both her own and others’ poetry. If you go to the Winterreise page, you’ll hear her read Müller’s poetry which Schubert set. Sometimes Lehmann can’t divorce her memory of the rhythms of the song she sang so often, from the raw poem itself. We must forgive her that lifetime association. So I’ve decided to open with a poem that she did not sing, so that you have a chance to hear the talented actress in Lehmann, not obscured by the association she may have had with a song. This will also be the case when I finally offer her Rilke’s Die Weise von Liebe und Tod, recorded in 1958, her second set of songs for the Caedmon label. First, from a recording session from 1956, here is Rainer Maria Rilke’s (1875-1926) Ich lebe mein Leben in wachsenden Ringen. The thought of the poem works well as the touchstone of Lehmann’s life. that move over the things. 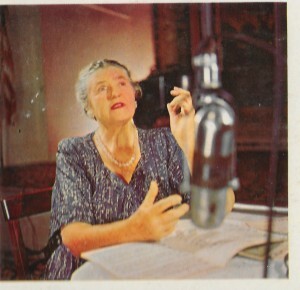 Let’s hear Lotte Lehmann read her own poem, at the age of 80, on a radio interview program. She and the interviewer are speaking German. In fliehender, der Welt entrückter Zeit! Der nur EIN Leben lebt, begrenzt durch Wirklichkeit? Schwebend auf Schwingen der Musik! Who only lives ONE life, bounded by reality? Soaring on the wings of music! Oh, world, let me be! Entice me not with gifts of love. What I mourn, I know not. for the One soon to appear. where, alone, the Joachim’s farm lay. but none might go down to him. For, already the two were quite beside themselves with ado. of a dark cow; for things had never been like this. den Blick, um diese alles anzuschauen. no longer remove from yourself: unless you tore yourself down. And overcome your breath and touch. That you are overcome by vertigo when you see them. Her eyes, to look upon all this. and heavier than the house. dieses erschreckt. Und sie erschracken beide. – see, that scares, and both startled. Then the angel sang his melody. on the high mountains of Judea. the greatness she now felt. on the other body, further along than she was. protected herself with her cousin. was already moved to leap for joy. merkst du’s noch nicht, daß der Herrgott handelt? don’t you see yet that God is at work here? his thick cap off. Then he sang praise. no longer suffices for me. the dark hearts, nocturnal fates that fulfill you. cast a shadow. Yes, it emanated from me. is reflected on your astonished faces. in the confines of the heart to torture them. earthly things stream through you. eternal would call out to you. and called it the earth. widening the radius of the world. God takes a home in a virgin’s womb. I am the glow of her ardency, guiding you. Aber (du wirst sehehn): Er erfreut. to you what now lights up the night? renders Himself mild and enters the world within you. Did you imagine Him to be bigger ? all measurements he passes through. Not even a star has such a path. how he already excels it all. and one regrets it in the end. But (you will see): He delights. and lose their mind completely. caused everything to turn angry with desperation? only the child was namelessly confident. approached them like a servant and took a bow. bowed down. And they sat, as in a dream. who beautified even her simplest things? Had not the wisest mistaken ears for mouths? And was not the house like new from his voice? to radiate her joy in him. and did not understand his objection. and the entire sacrifice was ordained, irresistible. Yes, it had been written. But was it ready then? in the blindness of her vanity. Had become blood with this wine. Mit solchem Aufwand wardst du mir verheißen. Where hard is hewn from hardness. And you were always more than I. You were announced to me with such extravagance. Why didn’t you just step out of me wild? and now you suddenly turn nature on its head. of a stone are rigid. now, I can give birth to you no longer. in healing. Yes, they healed, that was it. They had no need to grab each other firmly. And spoke: Now is the time for you to appear. Again as the maid servant, deeply affirming his command. And listened to angelic song. (Oh origin of nameless brooks of tears). Lifted her into her divine nature. irdischer Zeit, ein trockenes Gebrest -. sein längster Schmerz -: und stürzte plötzlich vor. the crowded heavens had been incomplete? spreading radiance the son was filling it. with a radiance that hurt her. cried out: Who is this one? his time on earth, a dried up injury-. His most enduring pain-; and suddenly broke forth. and carried her up the final steps. Fast als wär sie’s noch, nichts ist verschoben. In its folds like a fine cloth. Is stunned by her fragrance. Where becomes blinding and does not shrink? Aren’t you amazed, how gently she escaped him? It is almost as if she were still here, nothing has moved. Man, kneel down and see me go and sing. Lehmann never sang the Marienlieder of Hindemith, but she certainly sang Schumann’s Dichterliebe. You can hear her speak Heine’s poem and I’ll soon have her performance of the Lieder as well. I once loved them all in love’s bliss. is rose and lily and dove and sun. so schwindet all’ mein Leid und Weh! then vanish all my sorrow and pain! then I will be wholly and completely healthy. then I must weep bitterly. a song of my beloved. in a wonderfully sweet hour! it has shined in amicably. they match my beloved’s exactly. Ich grolle nicht, und wenn das Herz auch bricht. eternally lost love! I bear no grudge. that I’ve known for a long time. I bear no grudge, even as my heart is breaking. I saw, my love, how very miserable you are. and has gotten married to her. the young man is badly off. I go about in the garden. mir träumte du lägest im Grab. mir träumte du wär’st mir noch gut. still flowed down from my cheeks. I dreamed you forsook me. for a long time and bitterly. I dreamed you still were good to me. and give me a garland of cypress. and the word I have forgotten. and birds warble in them. and be free and blessed! and it melts away like mere froth. doch sag’ ich noch nicht was. though I shall not yet say what. in the Cathedral of Cologne on the Rhine. be so large and heavy? with my pain in it.